I absolutely love planters. There is something intriguing to me about grouping plants in containers to show off their beauty. I had the opportunity to travel to Wisconsin last week and wanted to share some wonderful plant displays that I have seen this summer. 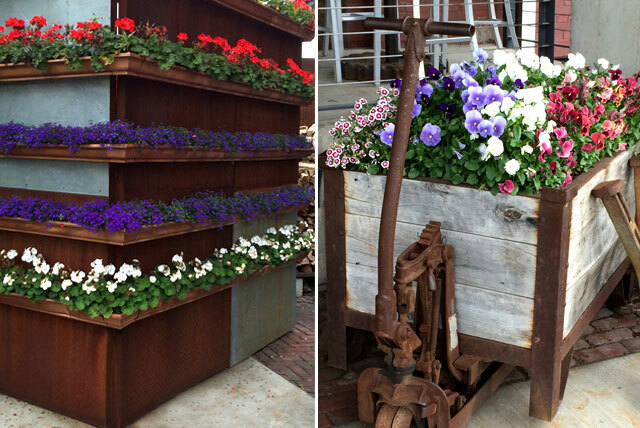 The planters with the old iron and weathered wood were so creative. They look so old and provide a wonderful place to show off favorite plants. When you are planting your containers, let the vines drape over the sides. Another show-stopper was a display of plants that are planted in rows on a wooden wall. Upon closer inspection, I realized each row was a gutter that had been filled with soil and plants. What a genius idea! 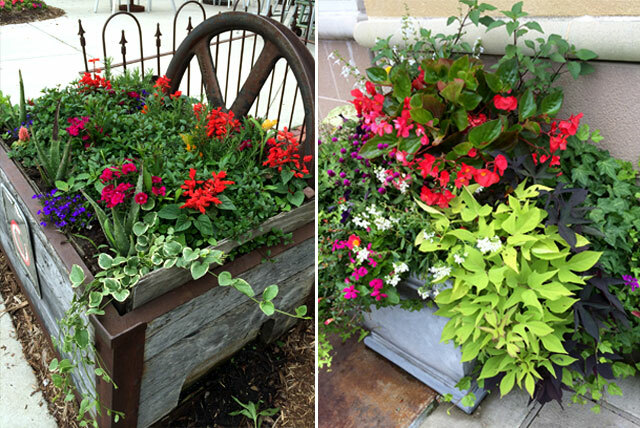 Traditional planters like mine are filled with vines and blooming plants. My front porch has two pairs of planters that stand side by side and are filled with caladiums and coleus. The leaves of these plants have dramatic color and are easy to grow. 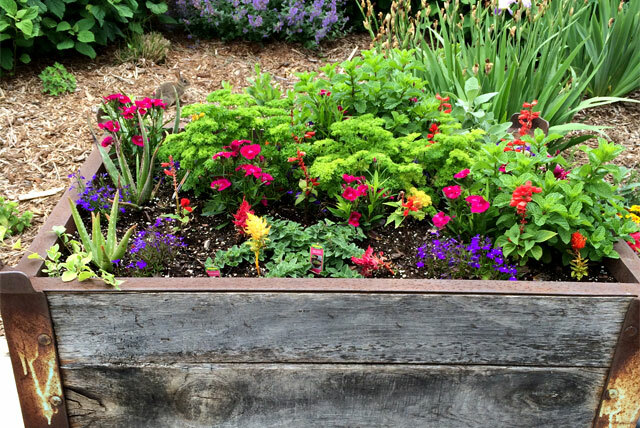 Share with me your container gardening ideas. I love to find new and beautiful ways to show off my favorite plants. Get your copy of the summer issue today! oh so many great ideas! thanks for sharing such lovely pictures! I plant geraniums, cascading petunias, and vinca vine in the double Wheeling washtubs I bought at an estate sale some years ago. I usually plant hot pink geraniums with blue and white petunias,and vinca vine, but this year planted Berry Parfait geraniums with orchid and white petunias. The tub is is on our deck overlooking the back yard along with my small collection of sprinkling cans and other zinc/galvanized items. 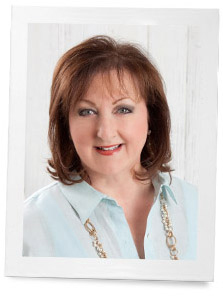 Love your magazines and your journal! I am happy to hear that you were recently in Wisconsin; I live near Madison. Our growing season is relatively short so container gardening is a must especially for those of us who simply can’t wait for the danger of frost to pass! In my cottage garden, any object that can hold potting soil, is the perfect planter. As you may have noticed, bucolic is the “life-style” here. What could be more beautiful than a delicate flower spilling over the top of some rusty old thing that forty years ago had another purpose. 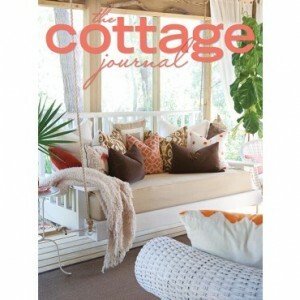 I love Victoria magazine; it is my favorite although The Cottage Journal is a very close second. Whenever either of them arrive in the mail, I drop everything, brew a pot of tea and sit for a moment (or two). Your publications transcend us, your readers, into a cozy home, a cheery shop or to the hill sides of England. It is always a wonderful journey, thank you! I love to container garden but in my Texas garden it doesn’t work out very well most times. When I do, the best material to use is plastic because it doesn’t retain the heat. Right now I have a long planter that I have filled with a variety of thyme that has done well this summer. Of course, we’ve had a ‘cool’ summer so I can’t really say how it would have really done with regular Texas temps. I’m not complaining because I’ve been able to use these varieties of thyme in my cooking and baking! My latest use of the thyme was in making fresh marinara sauce with tomatoes for the garden. What lovely photos! Thank you for sharing the inspiration.